Yesterday Paul went to Con-Way Freight in Eugene and picked up my new book. All 2025 lbs. And all 3240 copies. I feel somewhere between brave and insane, frightened and elated, and very dependent on the goodwill of readers. 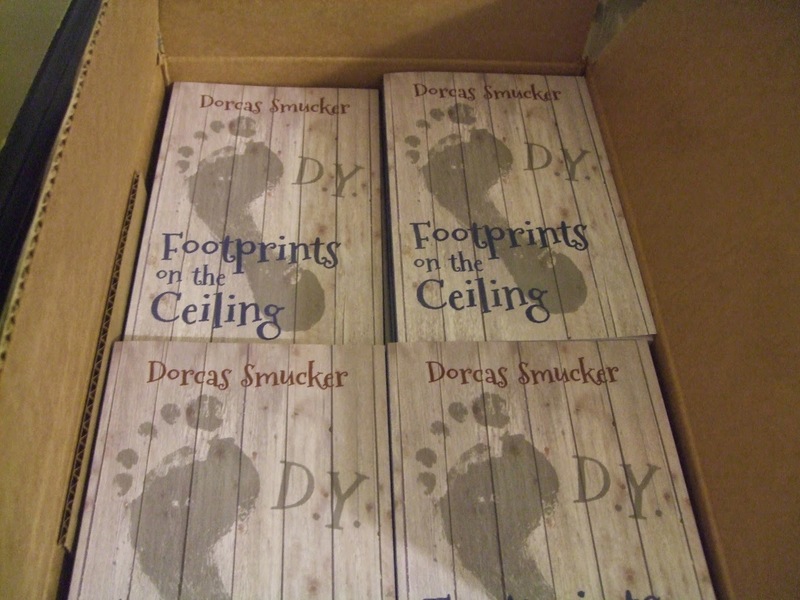 So, Footprints on the Ceiling is officially on the market. If you'd like a copy, send me a check for $15, which includes postage. 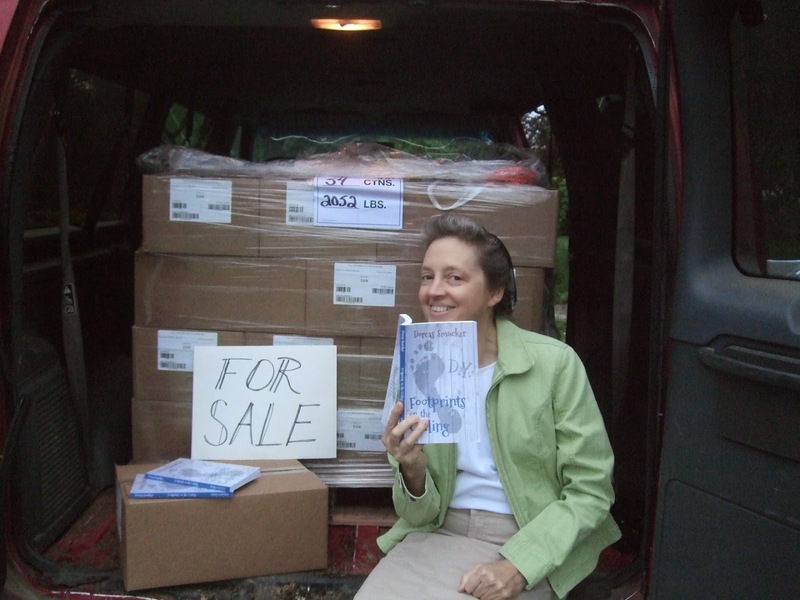 Discounts are available for larger quantities and for bookstores. Eventually, I hope to have the book on Amazon in both paper and kindle form, but that is a project for another day. Meanwhile. We have a whole pallet of books waiting to make new friends. Note: After a few months of writing for the Register-Guard every three weeks, I'm back to writing once a month, but still rotating with Bob Welch and Carolyn Kortge. Apparently, readers wanted to know exactly which Sunday they could expect to read each of our columns. Are we all busy, or just confused? Mostly, I listen to birds. 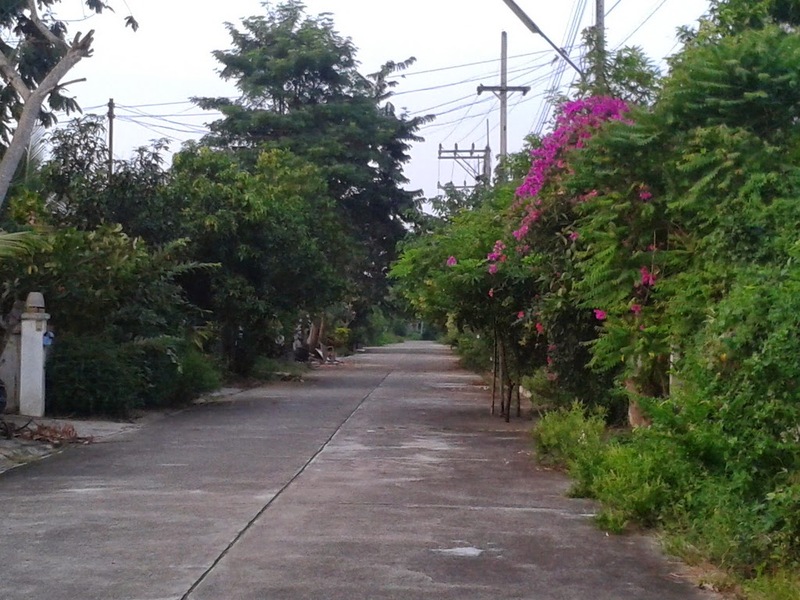 A truck shifting gears far away and an irate dog nearby, but otherwise the still, early-morning air in this Thailand neighborhood is full of chirps and twitters and coos. Over there a sharp choppy caw is answered by another, and a deep-voiced hammering sounds to the south. Constantly, over it all, a loud, clear bird-call seems to come from everywhere, sounding urgent but kind, like mothers calling children, with a strange tone that reminds me of bubbles rising, as though the warm, heavy air were actually water, and the birds’ friendly calls across the neighborhood were bubbling upward in the thick humidity. I sit at a little round table on a tiled balcony with a white rail. Two trees — one like an overgrown rhododendron, the other with fern-like leaves — obscure much of my view, but between them I see a line of single-story houses with red-tiled roofs and simple iron gates across the driveways. Miniature temples sit on elaborate posts in the corner of the yards, fresh with colorful streamers, giving off a hint of incense. The jungle seems close here, even in town, and one gets the sense that if you turn your back for 10 minutes, it will take over again. Trees arch over the fences and far into the streets. Every untended area looks dense and overgrown — the neglected yard across the road, the swampy area between fences. 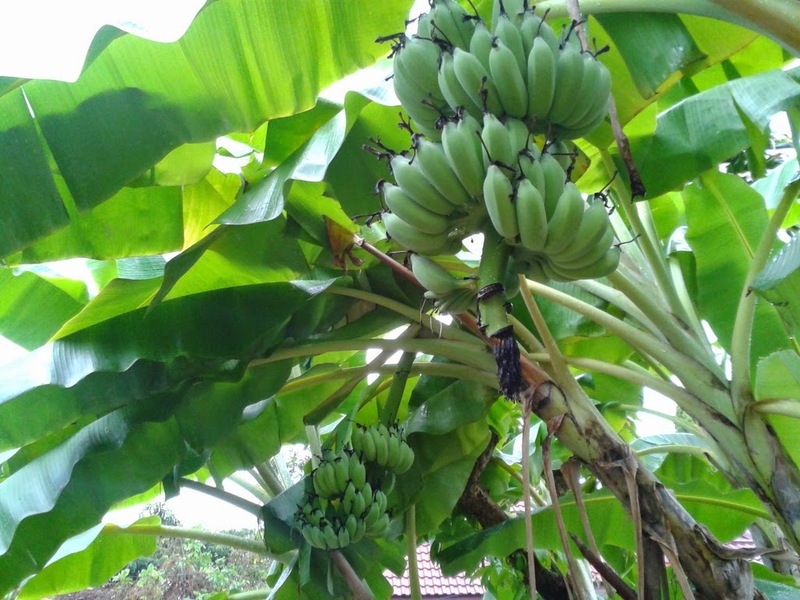 Huge bougain­villia flowering in an exotic purple peeks through the trees down the street. At another property, snake-like leaves of a roof-high plant drape themselves over a 5-foot-high wall. Doves with tiny heads and speckled shoulders pause on one of the 10 electric wires going by between me and the ferny tree. A small bird, maybe a hummingbird, buzzed into the neighborhood not long ago. Others are exotic black birds with white shoulders that swoop across the street in pairs or little sparrow-like birds that burrow with frantic rustling into the leaves. Some time ago, when I felt like I had more going on in my life than I could possibly handle, someone told me to define what “rest” looks like for me. Now I think: It’s actually happened. This is what rest looks like. This is how it feels. 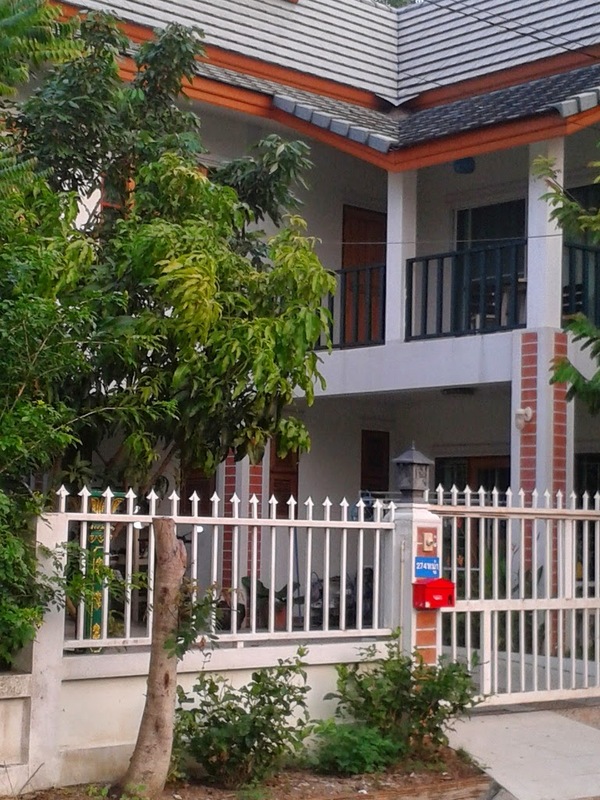 Our oldest daughter, Amy, moved to Chiang Mai, Thailand, last January. 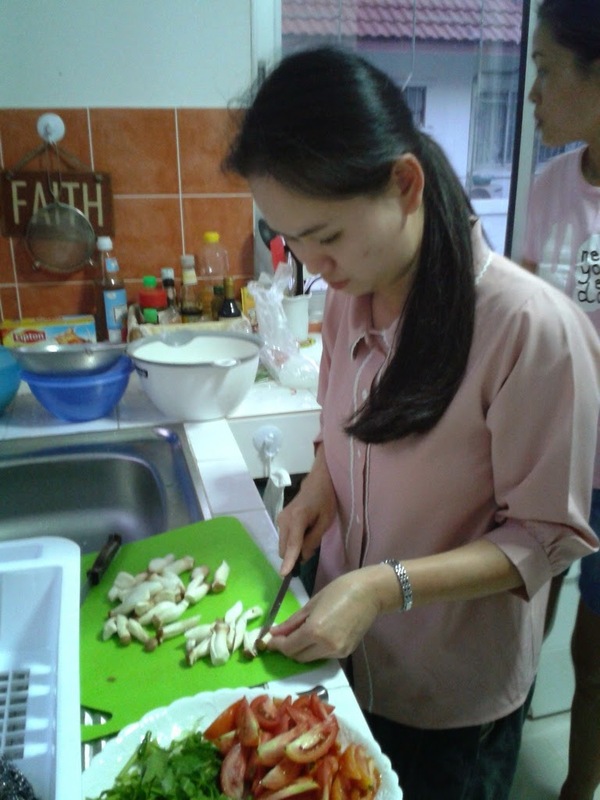 She immediately began taking Thai classes and learning to teach English as a second language. Paul and I try to visit our children wherever they scatter, for both their encouragement and our reassurance. Paul was asked to speak at a youth conference in Nepal in October, flying into and out of Chiang Mai, so it was the perfect opportunity to spend time with Amy. 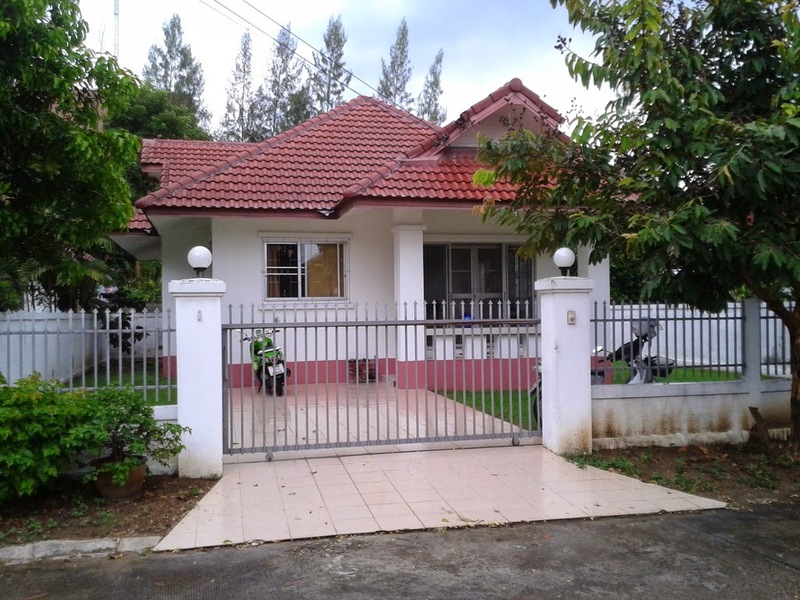 Since her house is tiny, she arranged for us to stay nearby in the home of generous friends who were away for a month. In the weeks leading up to our trip I cooked for seven people every day, hosted guests, canned green beans and 81 quarts of grape juice, watered flower beds, put a new book together and got it off to the printer, and took 10 children camping at the coast, returning less than two days before we left for Thailand. I was home alone for less than an hour between mid-May and well into September. Now and then, I wondered how this happened, this constant rush, the flood of responsibilities, the default answer of “busy” when people asked how I was doing. “The glorification of busy,” some call it, theorizing that we choose too much to do because, in our culture, it gives us a sense of importance. “Most people that are really busy are actually just confused,” says my neighbor Anita, and I suspect that’s the case with me, since it never feels like a deliberate choice. How could I have known in June, when I planted a late garden and took in my dad for the summer, that the green beans would coincide with grapes and guests and galley proofs of a new book? Rather, it seems the responsibilities just show up, usually in the form of blessings and loved ones, and I could never tell them to go away. So the way to stay sane through this stage seems to be in choosing time away, making it happen, giving it priority. We observe Sunday as a day of rest, technically, although for a minister’s wife it’s often as taxing as any other day. I hunted in the Bible to see what it says about rest and found it presented as both a command, to be chosen deliberately, and a reward, given unasked, which is what this trip has turned out to be. I wander down the street and buy iced coffee while Amy is in class, and then we zoom off to lunch at a little open-air restaurant and go shopping in the garment district with its endless fabric pieces rolled up on long tubes set upright on the floor. Despite the exhaustion of a day among wild traffic and sights and smells, I feel my soul unwinding. But mostly, it’s the time alone that has proven the sweetest. 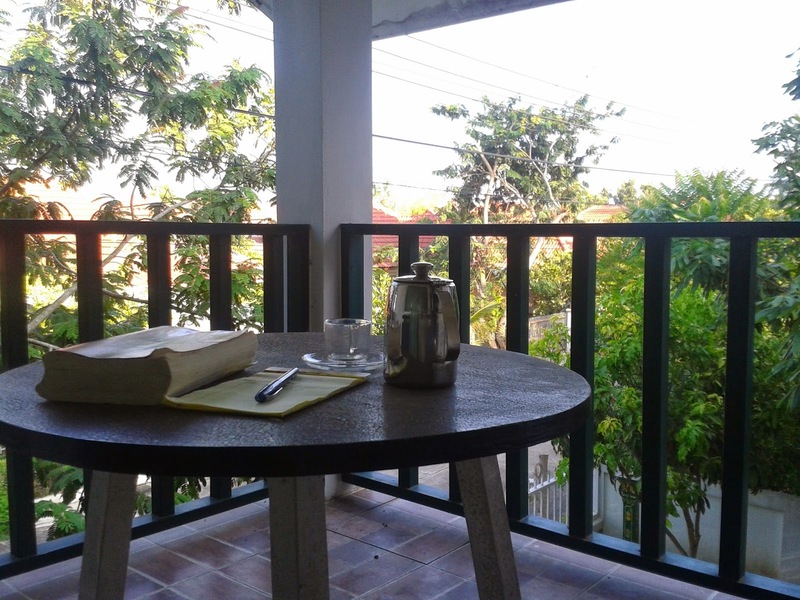 That first morning, I opened a door and found this inviting little balcony, waiting for me. “Come ye apart, and rest a while,” it said, paraphrasing Jesus’ words long ago. So, recognizing a priceless opportunity when I saw it, I have been going out every morning with a pot of tea. I watch the morning light spread over the greenery and the tiled roofs. No one speaks to me, no phones ring, no messages beep, no one knows I am here. In the Beijing airport, almost hidden among shiny shops full of expensive perfumes and thousand-dollar purses, there’s an area, beautiful but not ostentatious, featuring subdued colors, two large lily ponds crossed by a pretty angled bridge, gracious pagodas with little wooden tables and chairs, and two little tables offering squares of red paper, a bowl of ink, and two long paintbrushes for practicing your Chinese writing. I sat there and drank coffee and felt nourished in senses and spirit. It seemed the structure, like my delightful balcony, had been built with exactly that purpose in mind. Maybe we busy Americans need to do this, I thought. Not to disdain our work, but to see stillness as necessity rather than luxury. Maybe we each need to create a little place in our lives for deliberate beauty, for intentional rest, for bird calls rising, for restoring the soul's capacity to care and work and invest joyfully in all the people and opportunities that come its way. Going to another country makes you evaluate what you do and why you do it. For example: what it takes in terms of space and furniture to host guests. And: how you prepare food, and why. And why you use the eating utensils you do. Amy and Kimberly have a cute but quite tiny house with two bedrooms, a living area with a small couch and small table, and a little kitchen. One evening they invited a bunch of friends--staff from the local university plus one husband--to cook a Thai meal at their house. I was also invited, so there were eight people all together. At our house, that would mean two leaves in our big dining table and all our rather bulky dining chairs plus the two green ones I got from Paul's mom. Quite a lot of cubic footage in all. Kimberly wrestled a big rolled-up something out of the corner and proceeded to lay it on the floor. It was a big woven mat. The food was placed in the middle, plates were placed around the food, and we all sat around that, with plenty of room. They could have accommodated a few more this way, in fact. But first, of course, they made the food. They arrived with lots of fresh things--broccoli, cute white mushrooms, green onions, and tomatoes, which were washed and chopped and soaked in salt water with great busyness. Some were briefly cooked, and then the water was tossed out the back door rather than down the drain. I don't know why. Just like American tomatoes, except they don't remove the green core thing at the top. 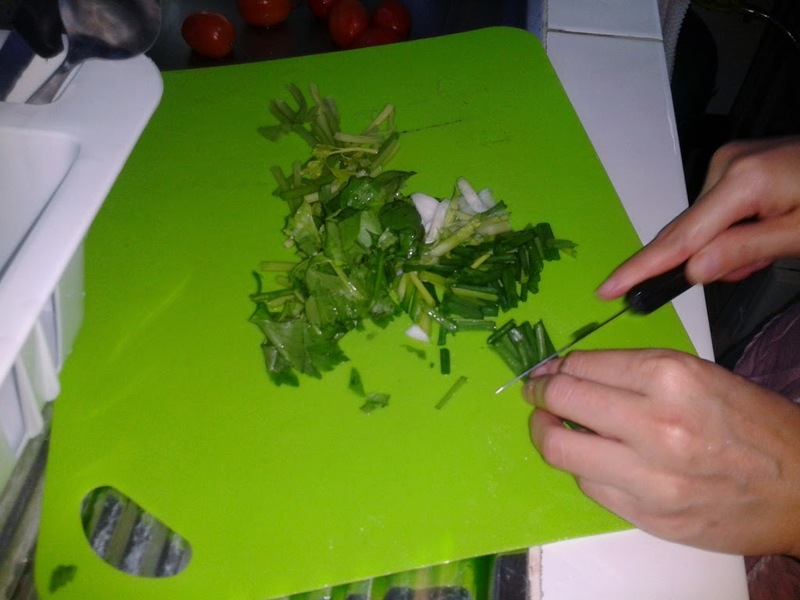 A number of ingredients were included purely for flavor and not intended to be eaten: lemongrass, which has a woody texture, tiny hot peppers to rival anything in Mexico and a green leaf that I forget the name of. I learned the hard way that these are not actually for eating, first crunching through a slice of lemongrass and then biting into a bit of pepper that sent searing flames shooting out of my nose and ears, and tears out of my eyes, while everyone offered their solutions and the nice lady to my left got me ice water and Kimberly said that where she teaches, the children are taught to eat a fresh vegetable if they bite into a hot pepper. 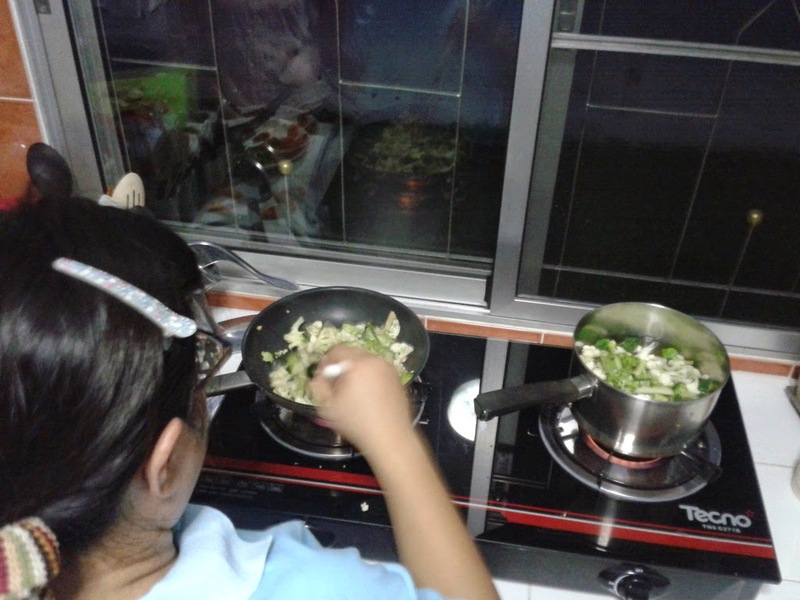 We had two vegetable dishes, quite similar except one was cooked, with noodles, and one was stir-fried, without noodles. Normally, the stir-fried one includes meat, but one of the group was on a meat fast for a month so it was left out for her sake. Stir-fried on the left, cooked on the right. The soup was tom kaa gai with a coconut milk base and a distinct lemongrass flavor. Then there was the interesting offering of pork sausage stuffed into pieces of squid. The squid part, it turned out, was actually supposed to be eaten. I took one small bite and found it quite rubbery and terrible, like chewing on the fat rubber band on a bunch of broccoli, with a fishy flavor. 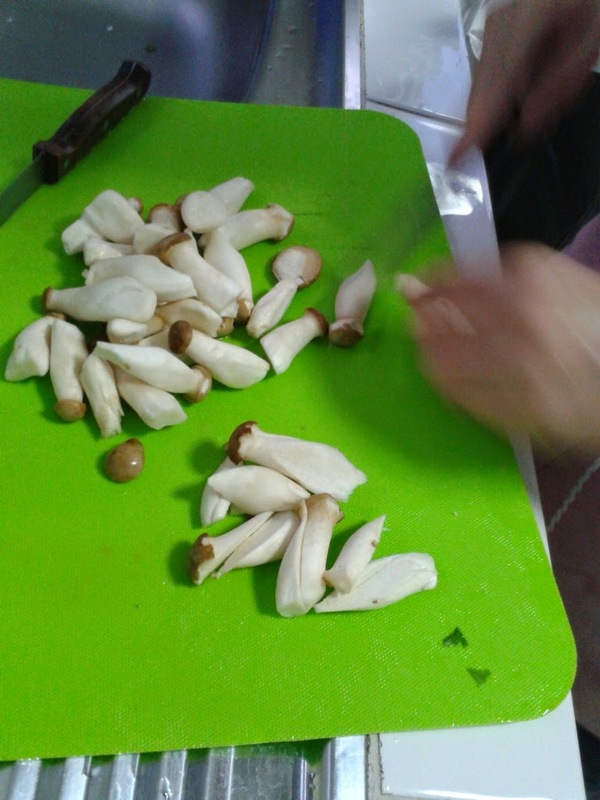 Thai mushrooms are just cute. It was a fun group. The standard utensils in Thailand are forks and big spoons--what we use as soup spoons in the U.S.--for most food, and occasionally little dipper-like spoons for soup. The forks are used as pushers and the spoons are for scooping and eating. 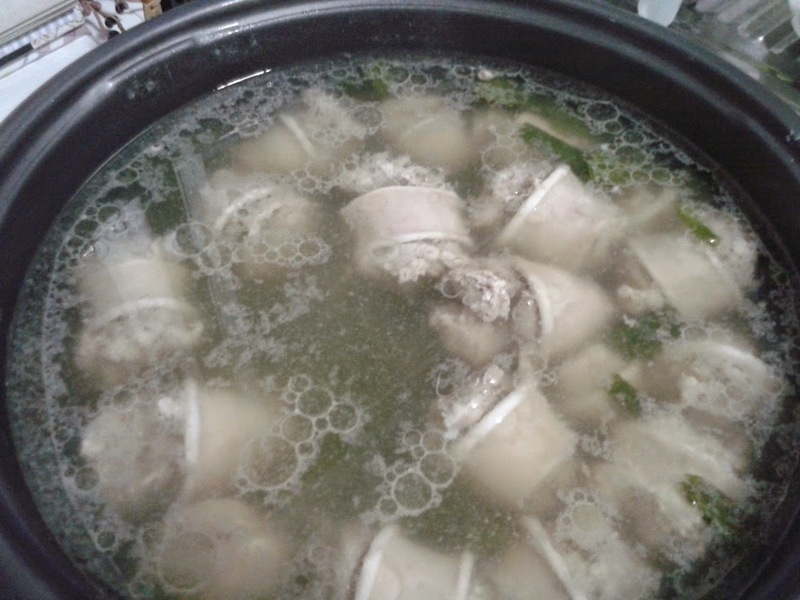 Usually the meat is cut into small pieces so no knife is needed, but if something needs cutting, such as the bony chicken pieces in the soup, the spoon is used. It seems a bit uncouth at first, but it's an efficient way to eat. Depending where you eat, you use chopsticks, but not very often. I suspect it's for foods that are more Chinese. Edit: Amy says, "Chopsticks vs. fork/spoon depends more on what you're eating than where you're eating. Often places will have both available, and if you order a soup with noodles you'll use the chopsticks and short spoon, and if you order something else you'll use the fork and long spoon"
When you sit on the mat to eat, it seems it's ok to bring a soup bowl up close to your mouth to eat, but the plate stays on the mat, and there's a definite art to spooning up the rice and noodles and toppings and veggies while sitting up straight, without leaving a trail of dribbles across the mat and up your skirt. 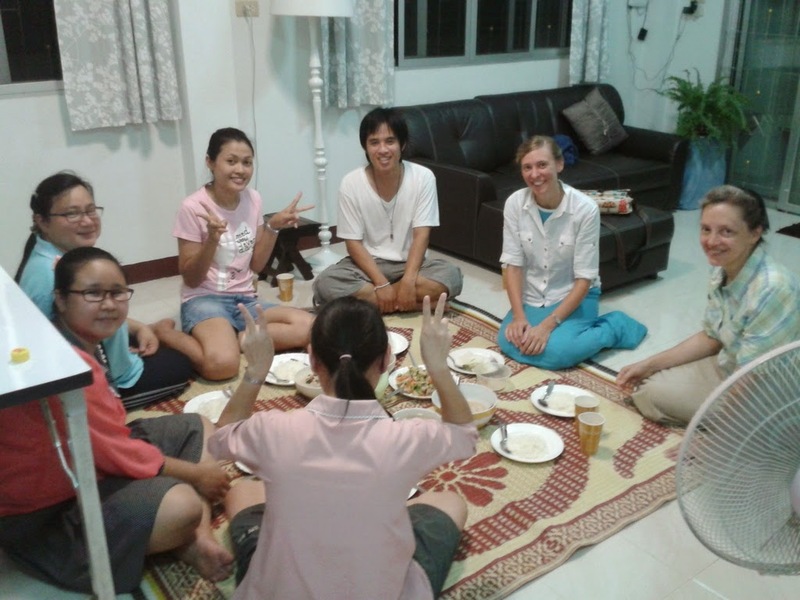 Later that evening, Amy's young friend Kim also came over, needing help with two assignments. One was a paper on human trafficking, in English, which seemed a terribly difficult assignment for her level of English. Amy and Kimberly thought I would be the perfect person to help her, so she and I went off to Kimberly's room and waded through that. The other assignment was to prepare a demonstration on the difference between European and American table manners. She pulled up a video on her iPad showing an American woman at a fancy dinner table showing us how to use all three forks and two spoons and numerous knives. 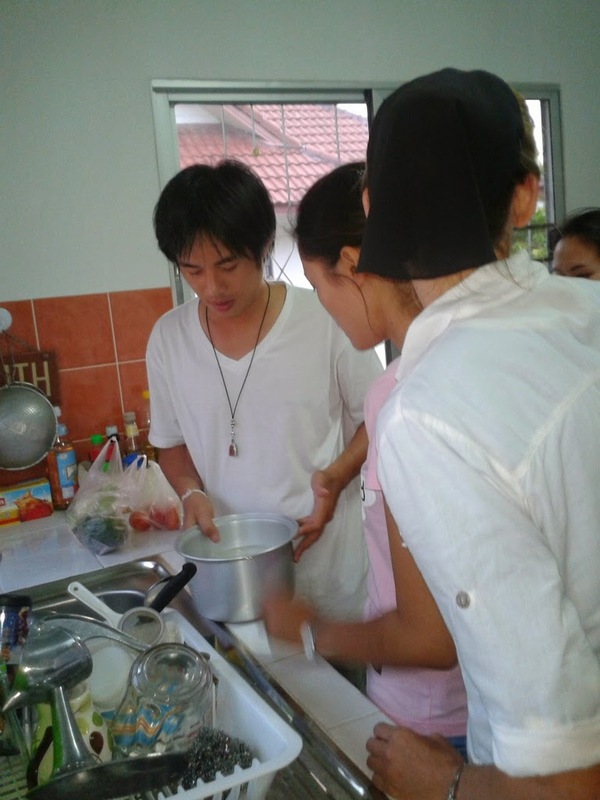 It all seemed kind of silly, considering how polite and tidy the Thai guests had been with one fork and one spoon. I told Kim the main difference is that Americans switch the knife and fork after they cut and before they eat, and Europeans don't. 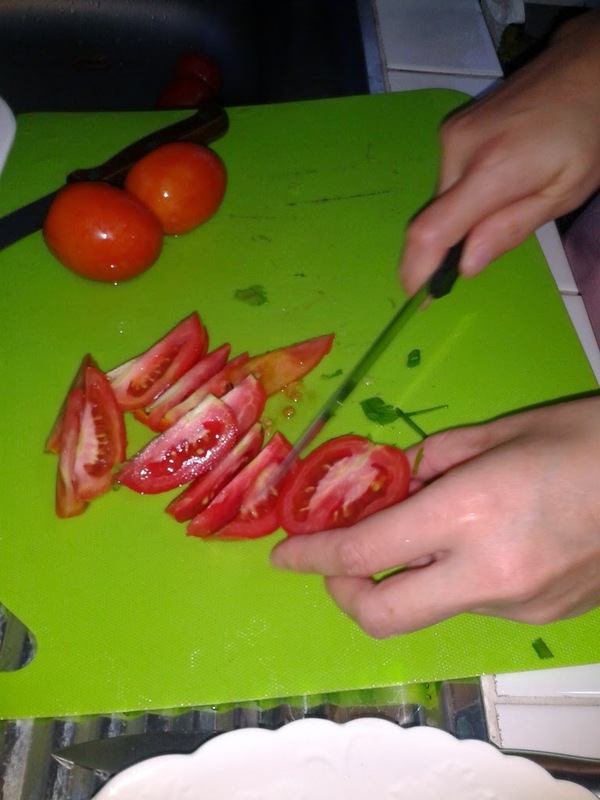 I got some silverware from the kitchen, including a sharp vegetable knife since I couldn't find a butter knife, and demonstrated until Kim felt capable of demonstrating to the class herself. Typically, I forgot to put it away, and Kimberly was a bit unnerved to find a big knife on her bed after everyone left. She laughed when I explained, since she finds it easy to laugh at things. I needed a few groceries one day, so when Amy left for her Thai class, I hopped on the back of her bike and she dropped me off at Big C, the supermarket a mile or two from her house. I would walk back when I was done shopping. The store wasn't open yet, and several uniformed workers sat around outside, waiting. I saw a "9:30" on the door among the Thai writing, so I had about ten minutes to wait. Finally the doors opened and I walked in. Big C has two stories. The ground floor has restaurants--including Dairy Queen, where you can get ice cream with corn in it--and also clothing shops and purse displays and lots more. And a few ATM machines, which is where I headed first. But three uniformed men were working on a machine, pulling out black boxes, so I decided to get my groceries and come back later. I took the escalator upstairs and turned into the main Big C store. I noticed a group of employees by the entrance but figured they were just having their morning briefing like they do at Walmart. But then I became aware of a line of half a dozen employees, dressed in white, on my left, all of them smiling and "wei"-ing--the praying-hands, head-bow greeting--as I came by. "Swa-di-kaaah Big Ceeee," they said. A bit flustered, I did one wei in return for all of them. Then I realized there was a line to my right, doing the same thing. I wei-ed them too. Dear me, what was going on? Past a lotion display, and there were more employees, and more and more, probably 40 in all, left and right, a long gauntlet I had to run, and it was like they were all doing a Wave, hands together and heads down just as I came close, smiles and smiles, and an echoing, "Swa-di-kaaaah Big Ceee....ceeee....ceeee." I wei-ed all over the place, feeling more and more ridiculous, and by the end of the ordeal I was starting to giggle, which was probably not culturally appropriate. And then I was through the hallway of people and could do my shopping, assuming that the first customer every day got this same treatment, although no one I talked to about it had ever happened to be there when the doors opened. Then when I went downstairs to use the ATM, the uniformed "Brinks" guys were still standing around. When I started using the machine, they whipped out a camera and started taking pictures of me. This stuff does not happen to me in Harrisburg. That evening Amy and her roommate Kimberly and I sat on the couch and watched "Roman Holiday," the old Gregory Peck/Audrey Hepburn movie. 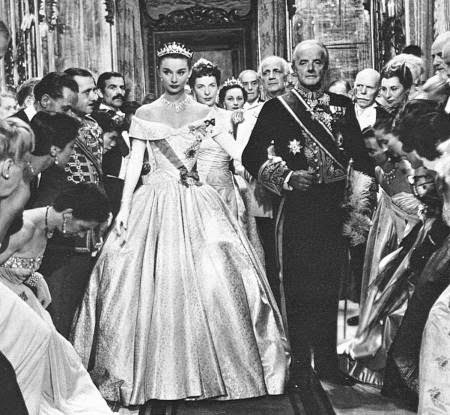 Hepburn plays a princess, and toward the beginning of the film she walks into the ballroom and everyone forms two lines and bows and curtseys as she walks regally along. I exclaimed, "That's exactly how I felt at Big C!" Later I was told that the wei is all about rank, and if a person of lower rank wei's you, you put your hands together to receive the wei, but you don't bow your head or, I gathered, be quite as effusive as they. So I'm guessing I would have been considered higher in rank and could have gotten by with smiling and briefly putting my hands together, rather than repeated and full-blown head-bows and swa-di-kah's in return. Of course there were plenty more things that don't happen here, such as the aforementioned gecko tail dropping down in front of me and riding all over town on the back of a motorbike. Then there was the beauty pageant I attended, and the dinner on the floor, but those deserve a post of their own. "Didn't you get the sense that the jungle was a living thing, and if you turned your back it would pounce?" Emily asked me last night after we were all at home and sitting around the kitchen catching up with each other. It was especially fun to compare notes with Emily, who had been to Thailand to see Amy just a few weeks before we went. I said, "Yes! I got the feeling that if you turned your back for ten minutes, the jungle would move in and take over." Oregon is lush and overgrown compared to barren places like Wyoming, where it seems you'd have to coax things out of the ground, but Thailand is exponentially more so. 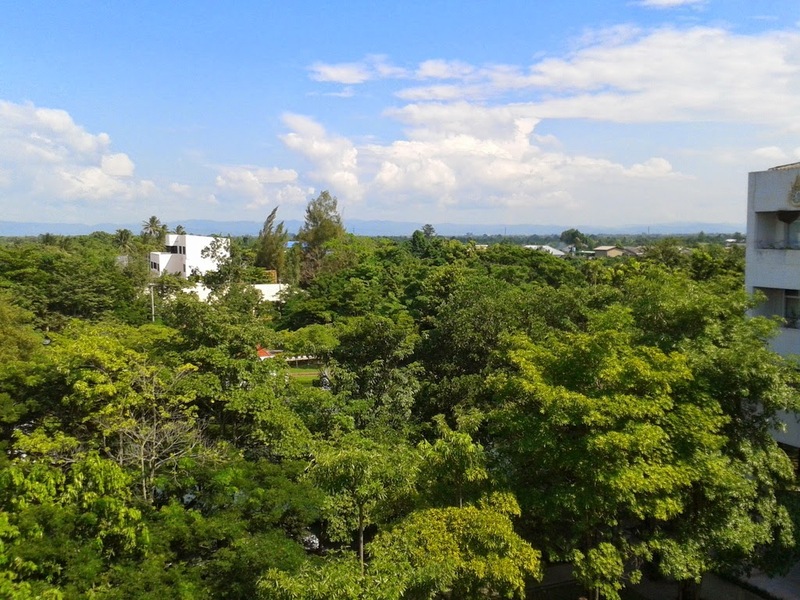 Looking out from a building at North Chiang Mai University. It seems like not only do plants grow everywhere, even in the city, but they leap out of the ground, spread their tendrils, claw their way up and sideways and through, like the streets and houses were put there entirely without their permission, and they're determined to get their territory back. This little side street near Amy's neighborhood was being taken over by undergrowth. As I walked along, two cars met right at the narrowest spot. They both had to stop and maneuver. The swampy strip behind the house where we stayed was full of huge overgrown weeds and trees and vines. 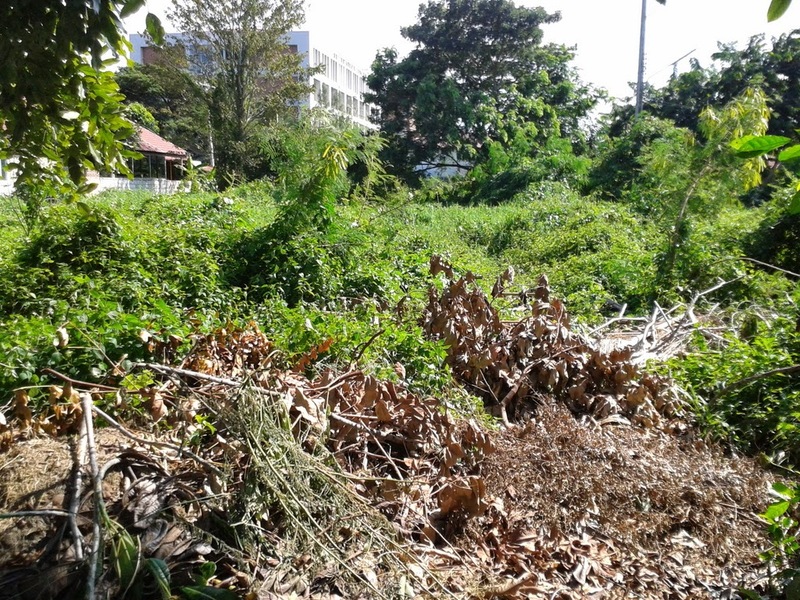 The vacant lot down the street was three feet deep in impenetrable greenery. The matted grasses grew out into the streets. Plants grew uncontrolled between fences and along canals and behind little shops. A vacant lot, just down the street from where we stayed. Amy's "mooban" [neighborhood] with the university behind. 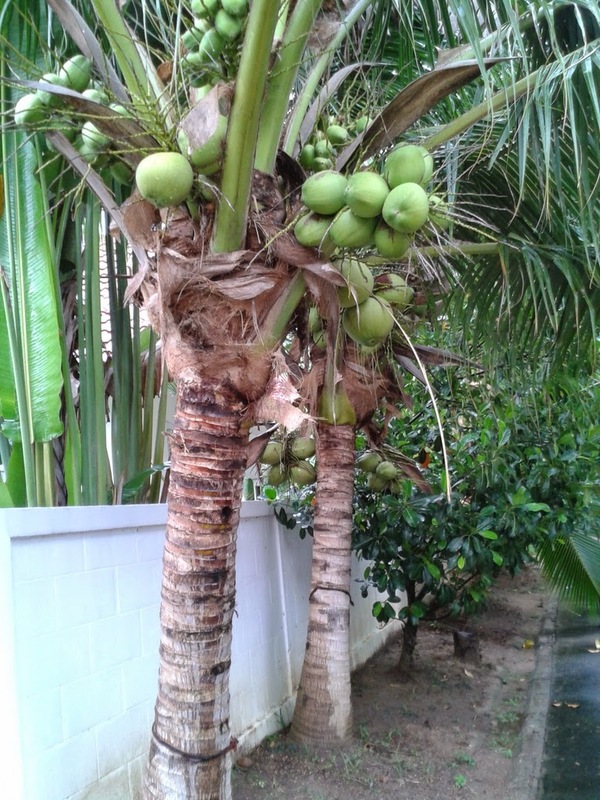 These grow along the street close to Amy's house. A lady in a nightgown comes out every morning and sweeps up the leaves on the ground. These were also between "our" house and Amy's. Every time you go out into the city you see workmen whacking back foliage, filling trucks with palm leaves and weeds and fronds and vines and stems. Beautiful but dangerous--that's pretty much how everything is in Thailand. Actually, we're in the airport, a gigantic structure with an intriguing slatted ceiling, way up there, and yellow flying buttress things holding up the curved walls of windows. Everything is gleaming and glassy. There are also multitudes of shops with expensive perfume and purses and watches, which also seems to be a fad in Asian and Middle Eastern and African airports. Seriously. 56,000 yuan for a purse. 83,000 for a watch. 6.297 yuan to the dollar today, the young man in the Cathay Pacific shop informed me. I prefer the Powell's Books store at the Portland airport. One gets the sense that the cleaning ladies here are paid to watch you. They are everywhere in their blue uniforms, wiping down the glass walls, squeegeeing the bathroom counters, refilling the paper towels. I went in the restroom to redo my hair and brush my teeth. The little cleaning lady squeegeed the counter, slowly coming my way, glancing at me out of the corner of her eye. I thought, Please don't rush me. I am dirty. She squeegeed the counter on the other side of me. Then she hovered and waited. Finally I finished and gathered my things. We got in to Beijing at some terrible hour and, compared to Chiang Mai, it was freezing cold. But we slept anyhow. After I woke up I went searching for tea, with my little tin travel teapot in hand. Behold, a little water dispenser that sent forth hot, cold, or warm, your choice! I pushed the buttons like it said. The hot water didn't come. Four or five people lined up behind me, waiting. Finally a tall young Chinese guy reached around me, pushed this button once, held that one longer, and there came hot water and soon I had hot tea. I was very happy. Later, Paul wanted to take ibuprofen since he's still kind of sick, but he didn't have anything to drink. I headed back to the same dispenser, since there were little cone-shaped paper cups and a drinking fountain right beside it. I filled a cup. Not enough to properly dissolve two ibuprofen, I was sure. Since you can't set down a cone-shaped cup, I held it in one hand and tried to yank another cup out the bottom of the two-foot-tall dispenser on the wall with my free hand. I pulled one off and tried to push the others back up the way they had come. The entire dispenser lifted off the wall and started falling. I stopped it with my shoulder and, with too many people watching, got it back into the slots on the wall with my one free hand. The extra cups fell to the floor. Another little uniformed cleaning lady quickly picked them up. I carefully carried two cups of water to Paul, who took his ibuprofen. I might have to send this to Jenny to post for me, since I can't open my blog here. And speaking of being watched...I get the feeling our internet use is closely monitored. We can open Pinterest but not Facebook. Emily's blog but not mine. Word Counter but not Google. Over among the purse and perfume shops is a lovely Chinese area with pagodas you can sit in to drink coffee, and an angled bridge over large lily ponds, and little tables with pretty squares of paper and a bowl of ink and two long brushes, where you can sit and practice your Chinese writing. It is pretty and restful among all the opulence. My sense is that places like this are spiritually as well as culturally significant in China. Maybe Christians should borrow this practice from Buddhism, of making a place that is deliberately and intentionally beautiful and restful. "The film length: 10 minutes. Along with the sowing." "This is my mother," says Amy to whatever Thai friend we are meeting, usually a student at the local university. The friend looks at me, smiles and does the "wei," pronounced like the letter Y--the traditional praying-hands, slight-head-bow greeting. A number of times already the friend has then turned to Amy and said something, then Amy turns to me and says, "She says you look young and beautiful." It is always gratifying, and it always takes me by surprise. Finally I asked if this is just part of the traditional greeting, lest I was squeezing too much enjoyment out of the statement. Amy said no. This is a sincere compliment. I think --Hmmm, if I lived here, would it compensate for the heat to hear that all the time? But the compliment also makes me sad, and this is why: Thai women try to live up to an impossible standard of beauty. To me, most of the women, especially the college girls, are astonishingly beautiful, with delicate features and dark eyes and clear lightly-browned skin and a fascinating friendliness and grace. So you can see why I qualify, especially on the first three points, despite crooked teeth and gray hair and other things that are not considered beautiful in America. 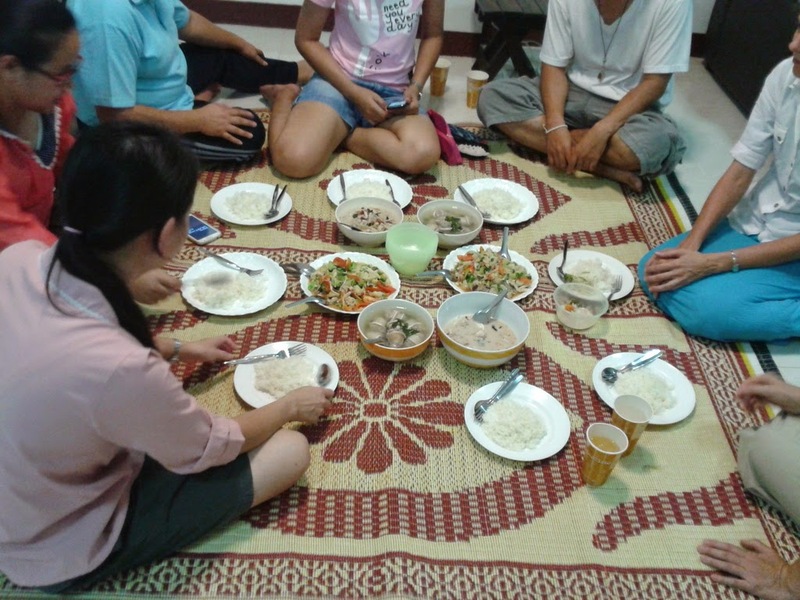 Thai people and Americans at a fun dinner I will write about on another day. 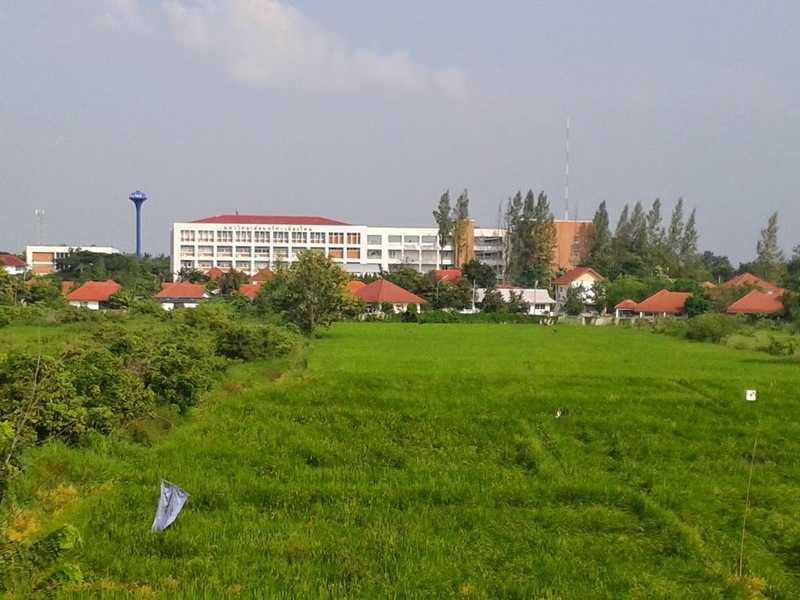 Most of the Thai students have the skinny figure qualification, but not the rest. So the local supermarket has racks and walls with hundreds of skin-whitening creams, and women ride around the city in hoodies and gloves on the hottest of days to protect their skin from the sun. I'm told that many women with the means to do so will go to South Korea to have surgery to make their eyes rounder and their nose bridge built up, and to get injections to whiten their skin. And how terribly sad that so many white American women--including ones I know--will obsess about food and exercise to attain a figure they were never meant to have, and will risk skin cancer and premature aging to lie under lamps or out in the sun to get that elusive tan that they were not born with and would never attain through normal activities. Says the lady who despaired that her legs were still pasty white even after a long hot summer with plenty of garden work and hanging laundry on the line. And who looked at said legs, which are whole and healthy and functional, and thought, "Ewww." What would happen if we women saw ourselves as astonishing marvels of creation, designed with care, loved and cherished and treasured, beautiful and whole? For starters, our husbands and children and everyone else who loves us and already sees us as beautiful would just about faint with joy and say, "At last!" I am staying in the home of Chad and Jenny, Amy's supervisors, while they're gone for a month. Paul is still off in Nepal so I'm here by myself, which is mostly fine. This community has been so safe that people leave doors unlocked with laptops lying around. And I was rather badly in need of some alone time, having calculated that from the middle of May to well into September, I had maybe an hour of being home alone. Don't worry, I do miss Paul and will be very happy to see him on Friday evening. That little balcony up there is a little early-morning taste of Heaven, with morning air that isn't cool, necessarily, but breathable and full of bird chips and twitters. I go to Amy's house, the equivalent of maybe 2 blocks away, to do email and online stuff, so it tends to not get done, because I have to be organized and intentional rather than impulsive. Also, Paul has my camera, so to post pictures I have to take them with my phone, email them to myself at Amy's, process them through Picasa on my notebook computer which is all new for me and we all know how quickly I pick up new tech skills. So, for everyone who has been asking for pictures of motorbike riding, helmet hair, and so on, that's why not many pictures are happening. A lot of things in Thailand are different from America and especially Oregon. One is the animals. Little geckos skitter up the walls just at the corner of my vision. 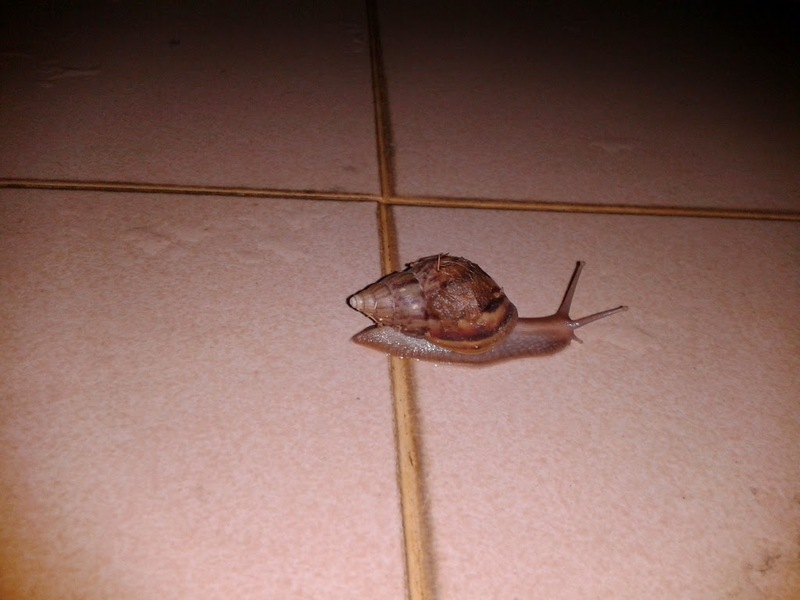 Last night a toad came hopping along the wall in the kitchen. I opened the back door and with a dustpan I encouraged it to leave. This was on the patio one evening. I didn't really mind these encounters. However, yesterday something happened that really bothered me. Chad and Jenny have a nice office on the ground floor, complete with a rectangular air conditioning unit high up on the wall above the desk. I had turned only the fan on, since the weather has cooled down somewhat, a turn of events that I greeted with great joy while the rest of Thailand put on their fleece jackets and shivered. So today I was sitting at the desk efficiently working on emails while the machine above me happily blew. Suddenly there was a crunching sound in the fan and something dropped down onto the papers in front of me. It looked very much alive, a nervous little piece of tannish gray flesh that fluttered and shook at one end like a small fish in a very big hurry. I think it was the back inch and a half of an unfortunate gecko. It skittered and shook and wiggled and waggled, on and on, over these papers and under those and up against another. One end was raw and bloody. The other was skinny and tapered, and it shook violently for probably three minutes. I was totally traumatized and nauseous. Finally it stopped. With great horror I picked up the papers in order to drop the piece of flesh into the garbage can. The bloody end stuck to the paper. I jerked it a bit. It fell onto the floor. My stomach turned over in horror and revulsion. I left for a while to collect myself. Then I came back with a dustpan and whisk broom, and I encouraged the fragment onto the dustpan, and I rolled it into the garbage. Dear Lord, have mercy on me. I'm glad this doesn't happen back home. Meanwhile, I get to wonder when the rest of the gecko will fall. If I wanted to get around in Thailand, I had to either walk or ride on the back of Amy's motorbike. Now, in Oregon, there is absolutely no livin' way you would find me on a motorbike, let alone riding behind someone else, with a helmet but no leather gear, in traffic so heavy you could reach out and pat the cement truck beside you. But context is everything. And that is how you do it in Thailand. So I do it too. At first I was terrified because I'd heard stories of the back person leaning wrong around a turn and throwing the whole operation into a nearby bus wheel. So I would try to lean scientifically around the turns and Amy would shriek that I was throwing her off. "Mom, you need to RELAX," she instructed me after we stopped safely. "Just RELAX." I told her she sounded way too much like her dad when I was in labor with her. "Ok, relax," he said in a friendly monotone. "Just relax." I had said some harsh words back then, but I was nicer to Amy. "Let's figure this out," I said. 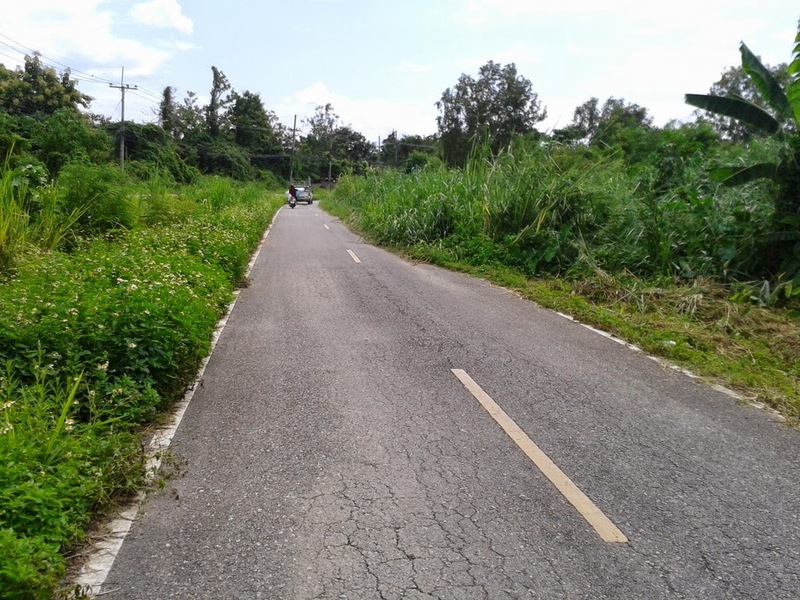 So we went around a few turns in the mooban [village/gated-community/cul-de-sac] where she lives. The key, I learned, is not to lean or consciously do anything, but to pretend you're a loose sack of pinto beans getting hauled to market. You concentrate on the back of Amy's neck and zone out like a tired sack of beans would zone out, et voila!, you'll be zipping around corners with no trouble at all. Which is what we proceeded to do, driving for miles on a busy highway, with the sun on our arms and the hot wind in our faces, passing dogs and cars and many other bikers, jungle and canals and shops and people. It felt fun and terribly dangerous all at once, and I felt exactly what I felt way back in 1986 when we had our first ride on a small plane in the North and suddenly there was fuel streaming out of the wing and the pilot made an emergency landing on a lake--"I might die, but what a fun way to go." We went all the way to the old market where the fabric shops spill their heavenly bounty onto the sidewalks from infinite supplies inside, tall rolls of every fabric you can imagine, wound around long cardboard tubes that are placed vertically on the floor in large islands surrounded by tight little canals where two people cannot pass each other without one of them leaning tight against the nearest bolts. This sometimes proves a dangerous operation as well, as someone--thank God it wasn't me--kicked the wrong bolt and down it went, and then the next and the next, breaking away from the cluster and avalanching down right over Amy's feet, trapping her in the narrow aisle. Danger lurks in the strangest places in Thailand. But, like I said, it manages to be both fun and terrifying. 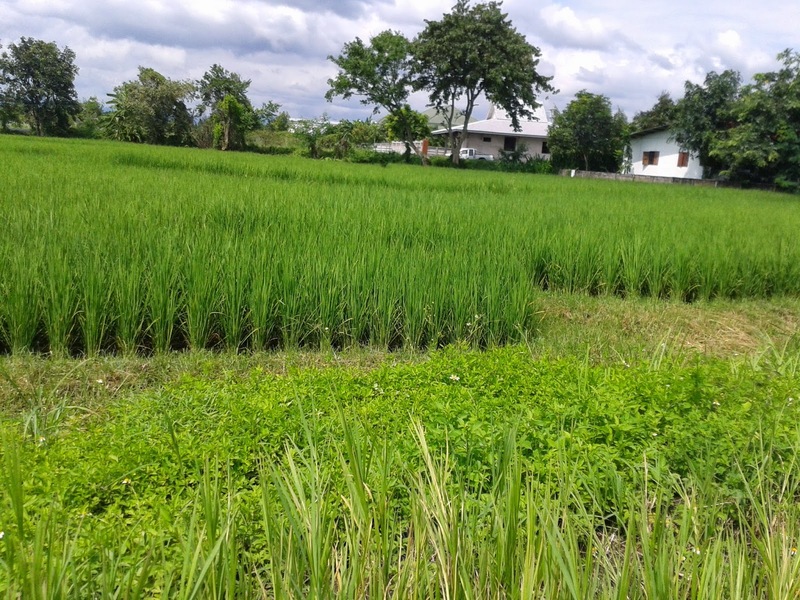 Today I walked along a long and hot and bumpy path, past rice paddies looking like ryegrass fields in April, red-tile-roofed houses with blue-green awnings, motorcycles, and a Dunlop tire shop. I carried two small bags of groceries, and just as I was wishing for a cup of iced coffee, there was a little kiosk growing out of the side of a white van, and a friendly gentleman obligingly fixed me a refreshing cup. "Soo-gah?" he asked. "Nit noy," I said, happy that my slim Thai vocabulary could actually be useful. So he put in "a little bit" of sugar, and the drink was delicious, with just a hint of a strange smoky flavor. The plastic cup was slid into a handy little carrier, and I sipped it all the way back to the house, a half-hour's walk. 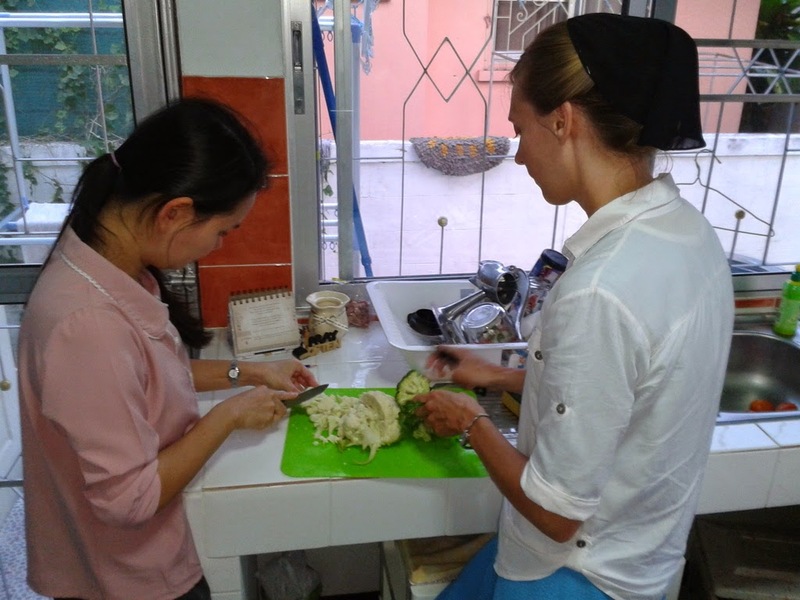 Amy has been in Thailand for almost 10 months, learning Thai and teaching English. Paul and I decided to combine a visit with her and also a trip to Nepal for Paul, where he was asked to speak at a youth conference put on by an Anabaptist group that goes out in the far corners of the earth to teach pastors and also, at times, young people. So Paul is off to some desolate place in the mountains of Nepal, a several-hour ride on a crowded bus from Kathmandu. And I am once again in Chiang Mai, thinking, "Who would ever have thought I'd be here three times in 2 1/2 years?" So since it's my third time in Chiang Mai I know which fabric store is my favorite and I know I want iced coffee and not cha yen, the Thai iced tea, at the happy little coffee stands. I know where the hopper of ice is in the Bible school dining hall, and the lifesaving fresh cold water. I know that I need to take off my shoes before I go indoors, that the exchange rate is about 30 baht to the dollar, and that I need to steeple my hands and bow my head a lot. October in Thailand is very hot but not as hot as June. Think 93 and very humid and no breeze vs. 100 degrees and very very humid and no breeze. So I've perspired a lot and found fans to park myself in front of, but it's just enough degrees less insufferable that I haven't yet felt like I was suffocating. Amy's roommate, Kimberly, is from Georgia. She has less tolerance for heat than Amy does. Amy keeps the A/C in her room at 30 degrees Celcius and would set it higher if she could. Kimberly is happy at about 25 degrees. My verse for this week: "Come ye apart, and rest a while."